Desire Rabies RDA Review - Daily Vaping Deals & The Best Vape Product Reviews at Vaping Cheap! Desire is a manufacturer out of Shenzhen, China and is home to the Mad Dog RDA and the Yuri RDA. In the line of RDA only atomizers, Desire have released the Rabies RDA – which is a follow up to the Mad Dog. The Desire Rabies is a 24mm aluminum RDA featuring a gold-plated two post – four terminal deck and comes with three different complete sets of screws. I would like to thank Heaven Gifts for sending us the Desire Rabies RDA for the purposes of this review. Click Here to Check Out the Desire Rabies RDA! The Rabies RDA comes in a small fairly straight forward box with a foam insert. There are specifications and dimensions labelled on the white box, with the company and RDA name on the front. The simple foam insert will protect the RDA from any transit issues and kept it secure. Underneath the atomizer and foam there is a spares bag that contains the extra post screws, screw driver and the spare o-rings. The screws are an interesting addition being that they include four hex screws that are already installed, four Phillips head screws and four slotted screws. All though this may seem like overkill, I think it shows initiative that different people prefer different types of screws. It is definitely personal preference for most people and this seems to cater for everyone. One first inspection of the Rabies RDA it reminds me of the Recoil RDA with a two post – four terminal deck layout. The outer most posts are raised up from the deck which should enable easier wicking due to the wire legs being out of the way. There is a bottom cap that is made from PET that separates this RDA from your mod. It will be interesting to see how hot things gets as it’s made mainly from aluminium and how this prevents heat transfer. The drip tip is also made from PET and looks a lot like the Goon being a small profile. There are two tear shaped airflow holes on each side that line up with a notch in the deck to provide side airflow to the coils. On close inspection this seems interesting in terms of how it is going to adjust and doesn’t look like it will provide exactly symmetrical airflow. More on this later. There was a slight hint of machine oil, so the Rabies received the obligatory wash and bath before use. The build quality seems legitimate and the gold plating on the deck appears to be of good quality, especially for an RDA of this price point. The threads are smooth and the top cap/chamber fitment seems to be that of correct tolerance. The airflow holes, to me, seemed a little sharp but that could have been the fact that they are cut of such an angle that it felt sharp – I’m not entirely sure here as I’ve never seen this type of airflow holes design before. Overall the Desire Rabies RDA looks good and has a good build quality about it. I’m happy that it’s name Rabies is only subtly engraved in the side of tank with the text not standing out too much. At this stage I think it looks promising, it’s just shame about the name, which doesn’t really appeal to me at all. The Desire Rabies breaks down into 4 separate parts for cleaning and building. The deck is fully exposed to make installing coils a simple straight forward process and provides plenty of room to do so. The orientation of the post holes makes installing very easy and you do not have to do any fancy legwork to make your coils fit. Installing the coils in this way now makes me wonder if the they designed the airflow to have the coils sit off center, which makes sense with the raised outer posts. The post holes are plenty big enough to accommodate some large diameter wire and there is enough room around the deck to run some fairly exotic coils if you so wish. The post holes also make suitable contact with thinner wires, so there is no need to worry if that’s your preferred option. Hex screws are personally not for me, so I opted for the Phillips screws which worked as they should with no problems on fitment or stripping. Wicking was a very straight forward process and it really helps that the outer posts are raised as the ends of the coil do not interfere with your wick and keeps things nice and tidy. I cut my wicks to the bottom of the deck and tucked them into the base after giving them a good fluff. The gold plating on the deck section holds up well, it seems to be applied well and certainly does not flake off into the wicks at all like some cheaply made atomizers. The gold plating also adds to the bling factor and is most definitely visually appealing. Dripping directly thru the tip was problematic for me, as the juice ran straight off the wick and out the airflow holes making a mess. Although it is my least preferred way to drip, this is a top off and apply juice directly to the wick job. I found this to be the cleanest way to use this RDA. Airflow is adjusted by simply rotating the chamber one way or the other. I would have to say that the airflow on this RDA is probably to most challenging part. The builds I used on the Desire Rabies were a combination of 24 gauge micro coils, SS 316L Claptons and a variety of twisted coils. There was not a lot of difference in each coil build, the main difference I found was how hot the RDA got. I can say that it performed fine in TC mode as well, providing the right information to the mods I tried it with. In terms of flavor, I have to say that while the flavor isn’t bad, a lot of the other 24mm RDA’s on the market will definitely beat it. I’m unsure if it comes down to the airflow, the lack of a dome in the chamber or just the general characteristics of this design. The vapor production was average and really depends on your coil build and how you have the airflow set. As I mentioned before the airflow on this design is really hard to get right. The way that it is setup, you can really only adjust it to favor one side of the coil and even then it’s hard to get right. The shape of the airflow holes and the notch on the deck mean the the airflow comes in on an angle and hits the coil indirectly. I think it’s best not to center your coil build on this RDA and use the oddly designed airflow to hit that particular side. Also in regards to probably not enough or appropriate airflow, the Desire Rabies RDA gets super hot. It doesn’t help with an aluminium design either which are prone to heating up more than others and also at a greater speed. 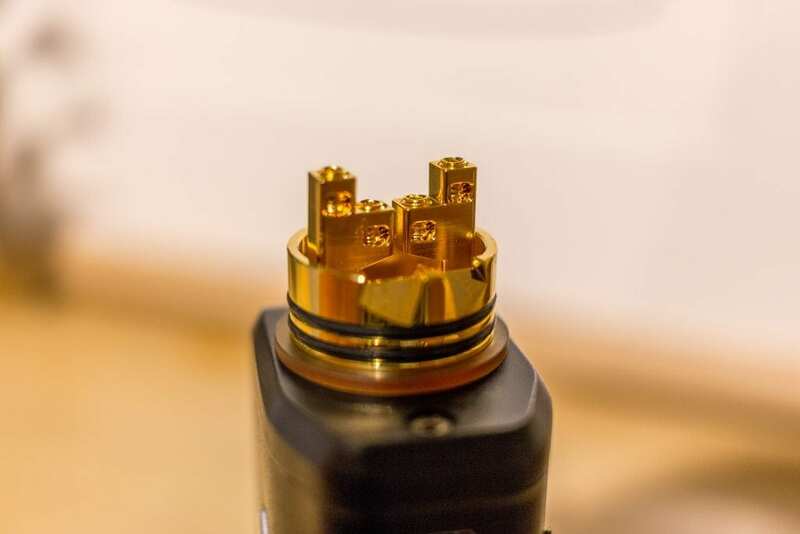 Given that the drip tip is a very small profile, you are forced to touch your lips to the body of the RDA, which at high temperatures is an unpleasant experience. Due to the design and shape of the drip tip, it tends to gather quite a lot of condensation, which after a while also gets annoying. It would have been a smart move, on Desire’s part, to include a drip tip adapter to mitigate some of these issues with a different tip of your own. At 24mm, the Rabies RDA looks good on most mods and doesn’t seem to have any connection issues or gaps when fitted. It isn’t a bad looking atty by any stretch of the imagination, it just seems to be held up by some major design flaws. Overall I have to say that I am on the fence with the Desire Rabies RDA. As you can probably tell there are some things I like about it and some things I do not. I think it has potential to be a lot better and rounded than it actually is. I’m just not sold on the airflow design or the drip tip. I understand that low profile drip tips are the in thing at the moment, but they need to practical and contribute to the overall experience on the atty rather than just sit there purely for looks. I like the deck, the heat plate at the base and the general looks of Rabies RDA – but I’m not a fan of the name. If you bring it down to price versus performance I would say that it’s probably just worth it. I personally think you can get better RDA’s for that price, however this may appeal to some people and if you have curiosity for how this will perform and you appreciate the price point – then go for it. I hope this has helped you on your quest for your next RDA or vaping atomizer. If you have any questions or feedback, we would love to hear from you in the comments section below.